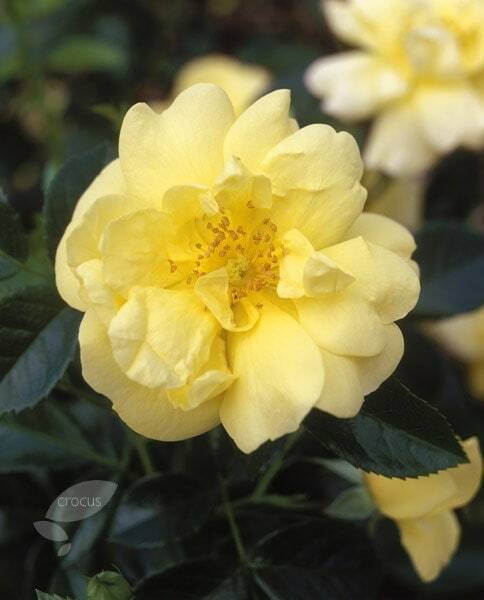 Gorgeously ruffled, pale yellow blooms appear continuously in large clusters from mid-summer to early winter on this attractive groundcovering rose. 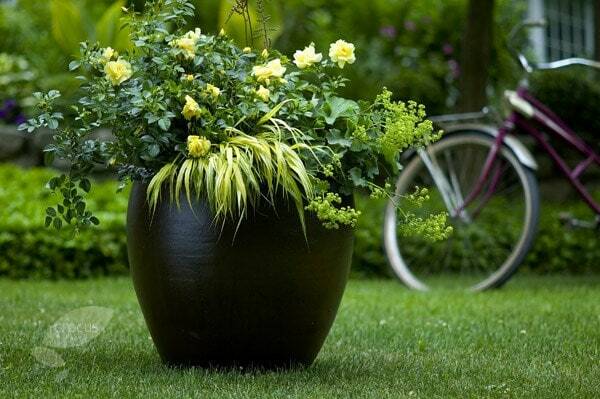 Noted for it exceptional resistance to diseases, the foliage is a glossy rich green, and it is useful for suppressing weeds in sun or partial shade. Hello, I wonder if you could tell me the name of the large plant with the variegated leaves in the background of one of the pictures. Many Thanks. 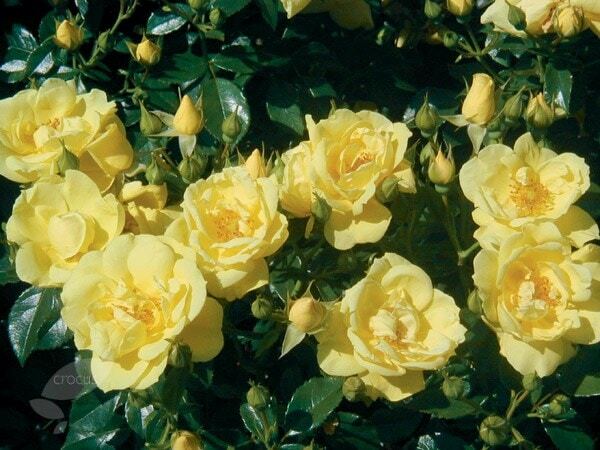 Hello, Most of the smaller roses (say anything up to around a metre or so), do well in large pots provided they are kept well fed and watered, but I would avoid anything that gets to big - and climbing roses, which never do well in a pot. 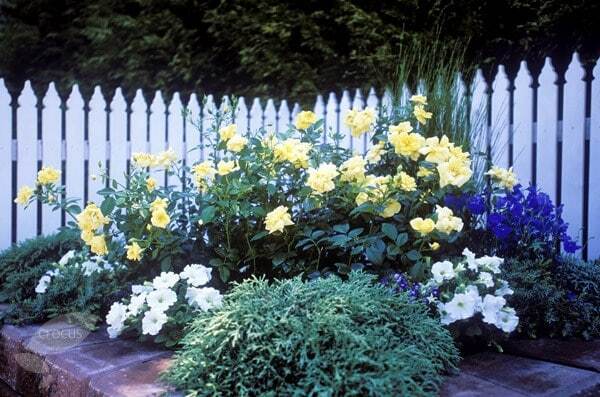 How far apart are flower carpet roses planted to a) form a hedge and b) for ground cover? Hello, These have an eventual spread of around 1.2m, so the planting distance will depend on what effect you are trying to create and how impatient you are. For a low hedge, I would recommend planting at 45cm intervals, but if you are using them for groundcover, you could plant them anywhere between 75cm to 1m apart. Hi there, in one of the pictures this rose is planted in a pot, there are a couple of plants in the pot with it, could you please tell me what the plant in the right side is? I really like it but don't know what it is. 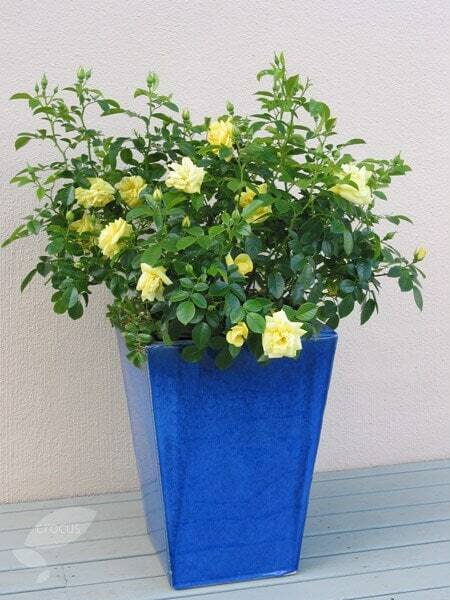 I am also thinking of planting this rose into a large pot, any idea what size pot I will need? 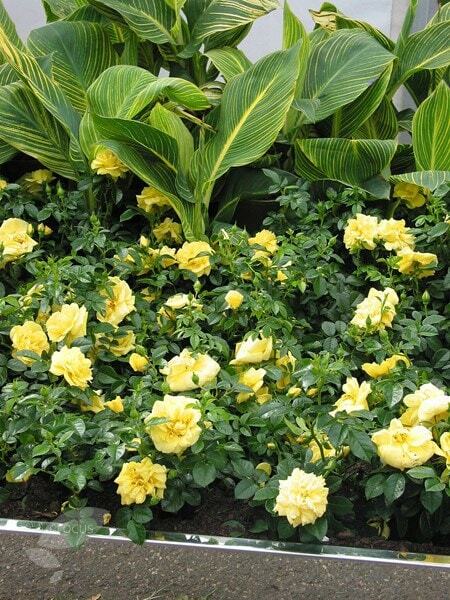 I have tons of roses planted into the ground but I would like to have some in pots that I can move around and change things up a bit. Thanking you in advance.